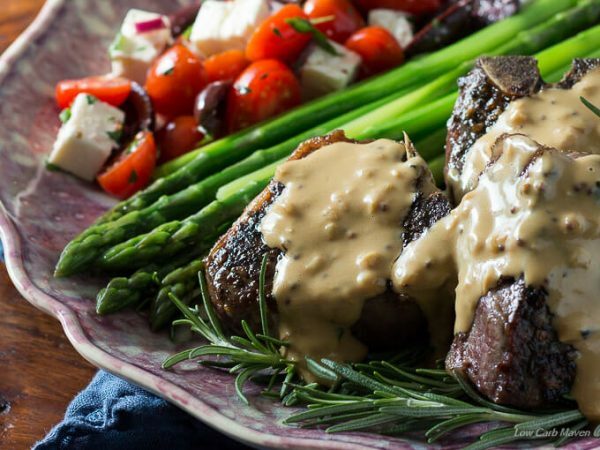 This easy pan seared lamb chop recipe flavors the lamb chops with a dry marinade of garlic and rosemary then finishes them with a silky, mustard cream pan sauce. Ready in 30 minutes! You’re going to love this easy pan seared lamb chops recipe! With Easter quickly approaching, I noticed quite a few “family packs” of lamb chops available at my local market. Lamb chops, and lamb in general, are not something I typically buy as it’s quite expensive, but I love lamb and just couldn’t resist. While many people opt for a large leg of lamb for Easter, my family is small, so an easy pan seared lamb chop recipe is perfect for us. I’m guessing that not everyone has cooked lamb before and you may be wondering how to season lamb chops? How to season lamb chops is up to you, but because lamb is a bit stronger in taste than chicken, beef, or pork, it can stand up to stronger flavors and seasonings. I have found that either a dry or a wet lamb chop marinade is perfect for adding flavor. Lamb is a common protein served in Mediterranean and Middle Eastern countries where stronger spices and herbs like garlic, rosemary, cumin, coriander, and mint are used in its preparation. Cool creamy yogurt sauces, pasta, rice and marinated vegetables are common accompaniments to lamb. Here in the U.S., one traditionally sees lamb chops seasoned with a paste marinade of rosemary and garlic or sometimes served with a mint sauce. After deciding how to season my lamb chops, I needed to tackle the question of how to cook lamb chops. I chose to pan sear the lamb chops because I wanted a beautiful pan sauce to dress them up. Cooking the lamb chops in the pan and then adding the other ingredients one by one, results in a layering of flavors that produces a really knock-out sauce. 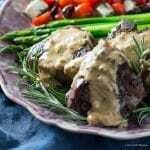 For this recipe, I chose a classic mustard cream sauce infused with shallot, rosemary, and garlic. 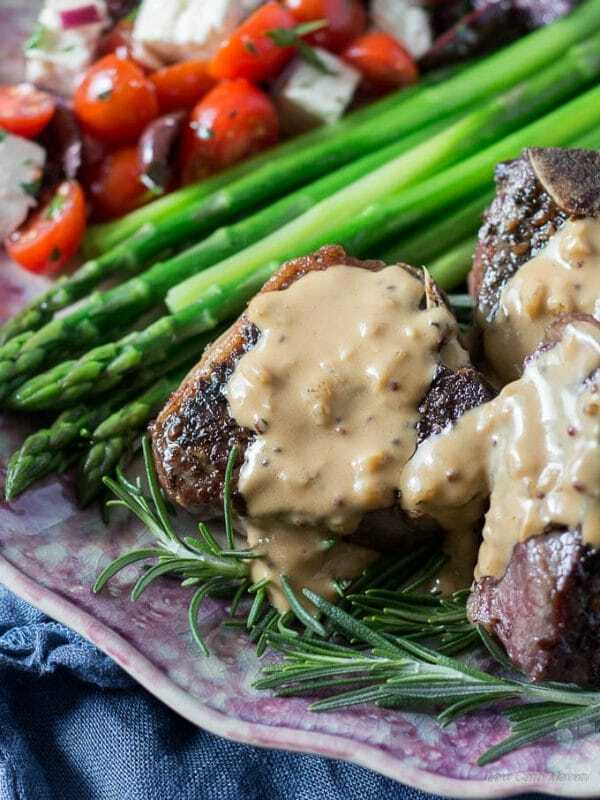 The addition of a grainy mustard (Maille) gives a beautiful visual texture to the sauce. A touch of brandy provides a caramel note and sweetness. Heavy cream evens out the flavors and thickens the sauce while adding butter at the end gives the sauce a great shine. If you love a great pan sauce like I do, take a peek at my recipe for Chicken with Pobalano Peppers and Cream or Salmon with Bacon Tomato Vodka Cream Sauce. Both recipes are truly wonderful. Try serving with sauteed mushrooms and thyme, a green bean mushroom saute, or green beans almondine. This easy pan seared lamb chop recipe flavors the lamb chops with a dry marinade of garlic and rosemary then finishes them with a silky, creamy, mustard pan sauce. Lamb Chop Prep: The day before - Place the minced rosemary and garlic in a small bowl with 1 tablespoon of olive oil. Trim off any excess fat (or stray bones) from the lamb chops, leaving a thin layer of fat about 1/8 of an inch. Place the lamb chops in a single layer in a shallow baking dish and season all sides with salt and pepper. Smear the garlic-rosemary-oil on both sides of each lamb chop. Cover with plastic wrap and refrigerate over-night. Prep: The day of - Bring the lamb to room temperature for 30 minutes. Mince the shallot and juice the lemon. Have the sprigs of rosemary and thyme ready. Put the other ingredients near the stove or have them measured and waiting. Cooking: Heat a large frying pan (non-stick or stainless) over medium high heat. When hot, add 1 tablespoon of oil, swirling to coat the pan. Add the lamb chops in one layer and turn heat down to medium. Let the lamb chops cook undisturbed for 6-7 minutes. Turn and cook again for another 6-7 minutes depending on how rare you like your lamb chops. Remove the lamb to a plate and cover loosely with foil. Mustard Cream Pan Sauce: Turn the heat down to medium-low and add the shallots, sauteing until softened. Add the beef broth and brandy and bring the heat back up to medium. Simmer for 1 minute and add the mustard, Worcestershire sauce and erythritol. Stir or whisk to combine. Whisk in the cream and add the sprig of rosemary and thyme. Let simmer for 7- 8 minutes or until almost your desired consistency - it will thicken as it cools. Add the lemon juice and butter, stir. Simmer until the sauce is glossy and thick. Check the seasoning. 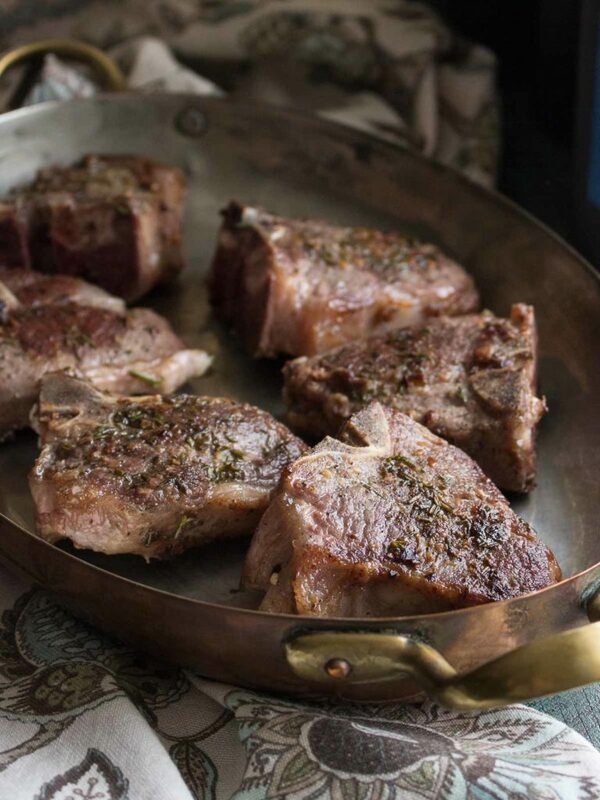 Remove the sprigs of rosemary and thyme before saucing the lamb chops and serving. I was about to go look for a lamb recipe for Easter dinner, and this showed up in my email. This looks delicious!! Thanks so much. I made this for dinner tonight and followed the recipe exactly. It was absolutely fantastic! I can wait to try this out, what is the side salad u have with the lamb. Is it tomatoes and olives? I made this recipe with your cauliflower “potatoes” (with celeriac root) and it was fantastic! We have eaten the mashed cauliflower for years but never enjoyed it as much as we did this combination! The celeriac root added just the right touch and the “potatoes” had just the right consistency. My husband was not sure about the sauce for the lamb since it contained the brandy… but he absolutely LOVED it. It was the perfect compliment to the lamb! I cooked my lamb chops 6 min. per side and they were a perfect med. rare which is how we like ours. As someone said in the comments, this is a “restaurant quality meal”. I am planning to serve the sauce with some lamb patties, too! It would be so good on so many other things! Thanks for all the hard work you do bringing us these recipes! I use a lot of them and usually do not take time to comment, but I really do appreciate you! I love lamb chops. This sauce recipe looks amazing!!! I love the creamy mixture of butter, mustard, and brandy….. Yum!!! I will be making this for dinner soon. This sauce was insanely good. I made it tonight and (to my shame) used my finger to clean the last of it off my plate. My husband called it “exquisite”. I prepared your lamb chops with mustard cream pan sauce tonight for my husband and I, and it was a recipe worthy of a standing ovation. My husband who loves lamb normally prefers it grilled, but he raved about this recipe. I used a Costco rack of lamb and just cut it into individual chops. They fit perfectly in the pan, so I ended up with a nice fond as a base for the sauce. Your photos also inspired me to roast asparagus and make a side salad with grape tomatoes and feta cheese. It was an outstanding dinner. Thank you for your wonderfully creative and tasty recipes. I look forward to reading your new (and old) recipes every week. Kim, these look soooo good! I am drooling. I love lamb chops. I have never had them with a mustard cream sauce. I can’t wait to try this.